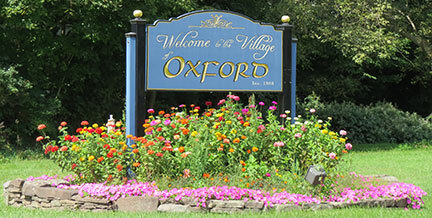 Oxford NY, a fine place to live or visit! Spend a day...a week...a lifetime in Beautiful Oxford, New York! Oxford, a small village located beside the Chenango River midway between Binghamton and Utica, in the heart of Chenango County, is a community of beautiful old homes, churches and well-kept parks. Oxford, NY is rich in history and diversity, and has much to offer the visitor including walking tours of historic homes and convenient shopping for everything from antiques to hand crafted items. Oxford is filled with a variety of art and craft galleries, a museum- rich with local history and artifacts, a folk music center (featuring some of the best -big name- performers anywhere), and loads to do for the outdoor enthusiasts! Outdoor activities like golf at our own Blue Stone Golf Course, as well as hunting and fishing are all available nearby. The surrounding countryside is a haven for everything from White-Tailed deer to Pheasant, Turkey and Geese, and our streams, lakes and rivers provide some of the best sport fishing in NY state. This site was designed to aid established residents, newcomers or visitors to our beautiful town, in finding out all there is to see and do in Oxford, NY, as well as detailing our rich and varied past. But aside from its charm and beauty, it's a community rich with warm and friendly people. Although Oxford is a small town, there are still properties big enough to have a productive farm and be completely self sufficient. Peace and quiet, all alone with nature. Another of Oxford's greatest assets is its residents. Oxford has a community filled with nice, concerned, enthusiastic, and involved people. You don't have to join in, but the spirit is contagious! The pharmacists at Bartles know their customers by their first names (and can tell you historic town tidbits too); the postal carriers deliver mail with addresses that aren't...quite perfect (because they know what it's supposed to be); Canal Street Hardware will offer advice to help you with most any project (and then help to carry your heavy items to your car); most stores still have a penny dish on the counters (in case you don't have exact change); neighbors still help neighbors; drivers will stop to let you cross the road; and other pedestrians will wave and say, "hi", even if they don't know your name. People in Oxford volunteer their time coaching summer sports to kids, helping out at the school, the Oxford Library, and the Youth or Senior Center. It sounds very idealistic, like a vision from the past, in today's mechanized, and often rushed society. Many caring people are in organizations or clubs that preserve the town's heritage (like the Oxford Historical Society, the Oxford Memorial Library, Promote Oxford Now); some preserve the beauty (like the Oxford Garden Club, The Village Tree Board, and again, Promote Oxford Now); some help people in need (like the 5 churches, the food pantry, the American Legion, the Oxford Volunteer Fire Dept., the EMT's, the Lion's Club, the Masons, and the Rotary); some enrich lives (all of the above, plus the Oxford Academy schools, Band Boosters, the Youth Center, the Senior Center, the Grange, book clubs, and more). Groups such as the Fire Dept. Auxiliary, Oxford Academy Student Council, Lions Club, Rotary Club, and others, get together "Community Gift Baskets" at Christmas time. There are fund-raising dinners and bake sales, Scouts visit the NYS Veterans Home to sing carols, or at other times school concert bands play music to the Veterans. There's even an Oxford Community Band, made up of student-to-senior-age volunteers, who play summer concerts in the parks. There are many civic and community groups that raise funds for student scholarships of all sizes. Many generations of families live here in Oxford, New York, a true testament of the love people have for this town. Feel free to follow the links in our site to learn about Oxford today, its history, its commerce, and its community.